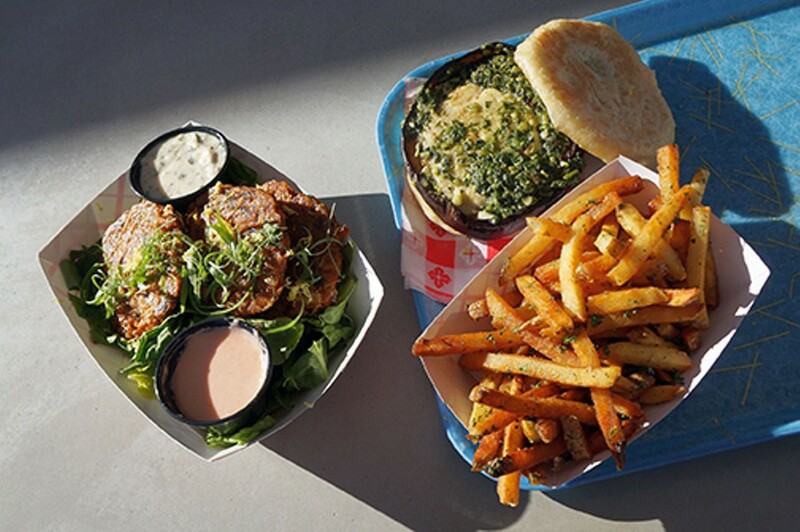 With Beaut Burger, vegans finally have a meatless burger joint to call their own. Just don’t ask for a salad. Courtesy A Beaut Burger meal. Daily: 11:30 a.m. to 8:30 p.m. The term "vegan" is nothing new. It was coined in 1944 by English animal rights activist Donald Watson as someone who completely abstains from ingesting anything that comes from a living animal, including milk and eggs. Vegetarianism had been in style for quite some time before then, but the idea of being a vegan was a food revolution. Thing is, back in the early days of veganism, eating nothing but plant-based foods was a bit of a hassle. There really wasn't much in the terms of culinary technology so I am certain most mid-20th-century vegans relied on raw vegetables, soy products and dirt. This is fine for people who view food as just a means to get by and survive but what about the good portion who love to indulge in the heady whims of basic human pleasure? That feeling of succulent meat, juicy and tender, hitting your brain, body and soul with a decadent stream of pleasure neurons honed through eons of evolution? A carrot between lettuce topped with topsoil just doesn't cut it. Does it? Luckily, through time, trial and a lot of laboratory tinkering, the idea of eating vegan on a regular basis has become so much more inviting that even a food addict such as myself can eat something devoid of anything related to an animal and not even notice. In a way, being vegan these days is too easy. Which is absolutely amazing. So those who once craved the offerings of greasy diners yet hate the fact that a cute critter with woeful eyes was harmed so they can have a moment of indulgent bliss can actually enjoy a life of guilt-free consumption. And without the murder. And this is what Beaut Burger chef and owner Kerry Lane wanted all along. "My husband and I just wanted a normal burger experience," says Lane. "What we noticed that is missing in the vegan community is just a lowbrow kind of divey place to drink beer and eat a great burger. So that's what we wanted and that is what we developed." Beaut Burger was years in the making. Before Kerry went to culinary school in Austin, Texas, she traveled around China and ate whatever came her way, even though she was a vegetarian. We are talking bugs, blood and questionable nasty bits. But after a while, that adventurous diet began to take its toll, so when she returned home and graduated, Kerry landed a job as a chef in Patagonia for a raw foods restaurant. From there, she moved to Tucson to work at Falora, where she met her husband. It was here that they began to develop the concept for Beaut Burger. "The burgers began with basically no knowledge, so we just kept experimenting," Lane says. "Eventually we had a product we were proud of. Each patty has about 30 different components, with the base being millet and pinto beans. Once we had something we knew could work, we began looking for a place to set up." That's when they met up with Adam Weinstein, the man behind the westside's newly opened MSA Annex, a conglomeration of shipping containers that is home to shops, bars and Beaut Burger. "Adam was really excited about putting in a corner burger joint, but it took about four years from concept to completion to get the place up and running," she says. "When we signed on it just kept growing and growing. The Mercado is so unique, and it just took the right people and the right amount of time to get it happening." Although I'm a consummate omnivore, sampling the goods at Beaut Burger did not disappoint. Your palate is tricked into the meat vicinity but the obvious fact that nothing with a beating heart went into those burgers is a revelation. It's the honed detail of spices, ingredients and imagination that makes eating there so glorious. With the addition of cheap beer thrown into the mix, you might as well be sitting in some greasy spoon chowing down on a greasy burger, except you're in an open patio and that burger is but plants, herbs and legumes. "We wanted a sort of masculine name," Lane says. "My husband and I were hiking when we came up with the name. You know, sort of like, 'It's a beaut, eh?' It just totally fit with what we are doing. We may be a vegan restaurant, but we did not want to go the vegan restaurant way. We wanted to be a diner. Cheap beer, good food and no salads. That's kind of a first for a vegan restaurant.